Following our exit from the FA Trophy against Weymouth on Tuesday the Harriers manager Mark Yates promised swift action in changing the side around and bringing some new faces in. Today, just in time for the Droylsden game tomorrow, he signed defender Alex Jeannin on loan from fellow BSQ side Oxford Utd for the remainder of the season. In the other direction went the Great White Hope Justin Richards under the same arrangement. 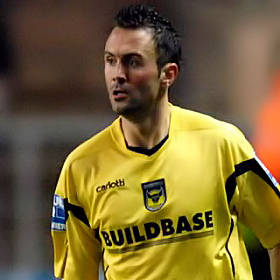 Bought to the club prior to the start of the season, Justin was Yates' biggest signing this year and it was thought that he would become part of a lethal strikeforce alongside James Constable. At first it seemed so but in recent weeks what few goals he did score have dried up and he now finds himself on the bench more often than not with Iyseden Christie getting the nod over him. The last straw probably came last Tuesday when Justin was bought on during the second half to help us reach the next round of the FA Trophy and failed miserably. His confidence in front of goal looks shot and now KHFC have started to get shot too. Jeannin started his career in his native France by signing for his local club Troyes from whom he moved on from to join Darlington in 2000. Since then he has played for Exeter City and Hereford amongst others and while at Edgar Street played alongside Andy Ferrell. He will probably start at Droylsden tomorrow allowing Michael Blackwood to move back into his usual position out wide.